The most prominent institutional shareholders are BlackRock, Fidelity (entities affiliated with it) and the Vanguard Group. Larry Page and Sergey Brin together have 51% of voting power. Then we have other individual shareholders like Eric Schmidt, CEO of the company from 2001 to 2015. Sundar Pichai, new CEO and John Doerr, venture capitalist and early investor in Google. There is an essential difference between ownership and control. And it starts with the different kind of common stocks issued over the years by Google – now Alphabet Inc.
Who are Google’s Directors and Executive Officers? What’s the compensation for Google’s executives? Who are Google’s top five individual investors and owners? When a company decides to issue equity in the form of common stocks, it can do so in several types depending on the limitations that the owners of the company want to give to voting powers. 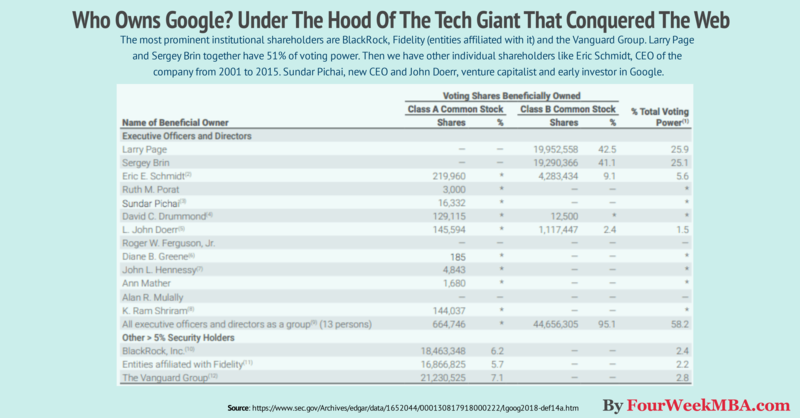 In Google’s case, each holder of Class B common stock is entitled to ten votes per share. Class B common stocks holders have ten votes for each director nominee and ten votes for each of the proposals to be voted on. We can define the Class B stocks as on common shares on steroid. In fact, they empower those who own them to keep control of the company. Page and Brin, Google’s founders wanted to keep as much power of the future decisions of the company they leveraged on Class B Common Stocks to have a higher weight on the company’s decisions. Google’s Class A common stocks are entitled to vote. Each share of Class A common stock is entitled to one vote for each director nominee and one vote for each of the proposals to be voted on. Holders of Class C capital stock have no voting power as to any items of business that will be voted on at the Annual Meeting. Those do confer ownership in the company and the right to be paid based on dividends and the company’s stock appreciation. 2. a Leadership Development and Compensation Committee, the purpose is to oversee the compensation programs. 4. an Executive Committee, serves as an administrative committee of the Board of Directors to act upon and facilitate the consideration by senior management and the Board of Directors of certain high-level business and strategic matters. From time to time, the Board of Directors may also establish ad hoc committees to address particular matters. Amazon.com, HP, Oracle Corporation, Apple, Intel Corporation, QUALCOMM, Cisco Systems, International Business Machines (IBM), The Walt Disney Company, eBay, Microsoft, Yahoo!, Facebook. We can break down all the compensations in base salary, bonuses, stock awards, option awards, non-equity incentives plans and non-qualified deferred compensations earnings. In terms of salary both Page and Brin get a symbolic $1. Eric Schmidt as technical advisor got $1,250,000 together with other compensations for a total of $4,726,592. Current CEO, Sundar Pichai earns $650,000 of base salary in 2017. To notice Pichai received almost $200 million in stock awards in 2016. In 2017 the total compensation was $1,333,557. Former Google’s CEO, Eric Schmidt in 2017 vested over forty million dollars in stocks, while new CEO, Sundar Pichai vested over a hundred-thirty million dollars in stock awards. For instance, in this table that shows the unvested (not yet exercised) stock options held by Schmidt and Pichai by December 2017, you notice the so-called exercise price. That means, for instance, that in 2021 Eric Schmidt can purchase 181,840 Google’s stocks at $306.61. Just to put things in context at the time of this writing the price of Google’s stock (Alphabet Class A stocks) is $1,225.42. Thus, if in 2021 the stock of Google will depend on those level, Schmidt will earn on the difference between the exercise price and the current price when options get vested. As defined in the proxy statement before Google’s IPO percentage ownership is based on 162,550,115 shares of Class A common stock and 114,732,822 shares of Class B common stock outstanding at March 28, 2005. At the time, just like today Brin and Page seemed to be obsessed with control and ownership. In fact, at the time both of them held over 55.6% of voting power. Back then the other individual investors with a consistent stake in the company were – at the time – CEO Erick Schmidt, venture capitalist John Doerr, venture capitalist Michael Moritz and Omid Kordestani, who at the time was in charge of Business Development and Sales and one of those who helped Google scale up (he closed the AOL deal). As of January 31, 2018, there were 298,492,525 shares of the registrant’s Class A common stock outstanding, 46,961,288 shares of the registrant’s Class B common stock outstanding, and 349,843,717 shares of the registrant’s Class C capital stock outstanding. The most prominent institutional shareholders (those with more than 5% of Google’s – now called Alphabet – share) are BlackRock, Fidelity (entities affiliated with it) and the Vanguard Group. If we look at the individuals owning the company we have Larr Page and Sergey Brin, that together have 51% of voting power. Then we have Eric Schmidt, CEO of the company from 2001 to 2015. Sundar Pichai, new CEO and John Doerr, venture capitalist and early investor in Google. Founder of Google together with Sergey Brin, Page was the inventor of the PageRank algorithm that made Google the success we know today. Director Since 1998 Larry Page, Chief Executive Officer of Alphabet. He has served as a member of Board of Directors since its inception in September 1998. Founder of Google together with Larry Page. Director Since 1998 Sergey Brin, President of Alphabet, has served as a member of Google Board of Directors since its inception in September 1998. Defined as the first “grown-up” brought as CEO when Brin and Page were still in their 20s, Schmidt is director Since 2001. He has served as a member of our Board of Directors since March 2001 and as Executive Chairman of Google Board of Directors from April 2011 to January 2018. Eric holds a Doctoral degree and a Master of Science degree in computer science from the University of California, Berkeley. One of the venture capitalist being – almost – since the beginning, John Doerr was director Since 1999 and has served as a member of Google Board of Directors since May 1999. John Doerr has been a General Partner of Kleiner Perkins Caufield & Byers, a venture capital firm, since August 1980. Newly appointed CEO – since 2017 – he has served as a member of Google Board of Directors since 2017. He previously served as Google’s Senior Vice President of Products, from October 2014 to October 2015. And as Google’s Senior Vice President of Android, Chrome, and Apps from March 2013 to October 2014. Since joining Google in April 2004, Sundar Pichai has held various positions, including Google’s Senior Vice President, Chrome and Apps; Senior Vice President, Chrome; and Vice President, Product Management. Prior to joining Google, Sundar worked in engineering and product management at Applied Materials, Inc., a semiconductor company, and in management consulting at McKinsey & Company, a management consulting firm. The data used in this article comes from the official Proxy Statement of Alphabet. Over the years, while the ownership of Google has slightly changed, one thing has remained constant, control and ownership by its founders. Brin and Page still represent the major individual shareholders. Also, as Google issued several kinds of common stocks, Brin and Page are the ones who – with their Class B common stocks – preserved their control over the company. Even when back in the 2000s a “grown-up” CEO, Erick Schmidt was brought in, Brin and Page still had more than 50% of voting power. The company has adopted several collective decision-making systems over the years. Yet Brin and Page remain in control of the future of the company. Next Next post: What Is A Phoenix Company?